When I started this blog six years ago, I took a look back at the first ARIA chart I collected from July 1987. Since then, I've recapped every ARIA top 50 from mid-1983 (when they began) to mid-1993. Of course, even though there weren't national chart printouts available at record stores before then, there was a weekly list compiled of the biggest singles in the country each week: the Kent Music Report, which David Kent had put together since 1974. 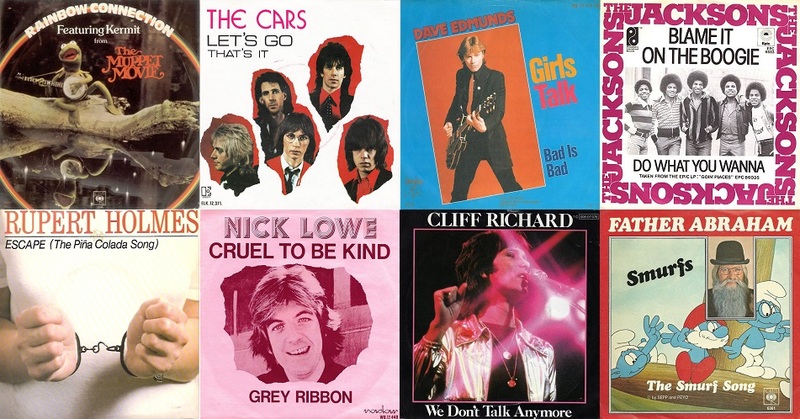 To mark the sixth anniversary of me starting this trip down memory lane, I thought it would be fun to go back to the very first week of music's best decade and see what was on the Kent Music Report top 50 at the start of 1980. I'll count down numbers 50 to 26 in this post and complete the trip to number 1 in Part 2. Australia seems to have been the only country where these two tracks from Discovery were issued as a double A-side, but it didn't do ELO much good, with the pairing not progressing much further. The week's first new entry was the debut release by Sydney-based band The Reels, with the bouncy and unique "Love Will Find A Way" finding its way into the top 40 thanks to a little help from Countdown. It'd be a few more years before the band enjoyed a really big single, with the first of two hit cover versions they'd release during their career. The follow-up to this top 10 smash might have been struggling to gain traction a couple of places lower, but it did have a lot to live up to. A highlight of ELO's career, "Don't Bring Me Down" spent its 19th and final week in the top 50. It also happens to have been one of my favourite songs from 1979... when I was four. Here's one of my favourite songs from 1978, which was belatedly making its way up the Australian chart as the '80s began. I'm guessing it was spurred on by the success of a tune we'll right at the other end of the top 50. He had two Australian chart-toppers in the 1960s, but trumpet player/musician/record label founder Herb Alpert hadn't been inside the top 50 in over 10 years... until he returned to favour with this US number 1 instrumental. The Grammy Award-winning song will be familiar to hip-hop fans, being used in Notorious B.I.G. track "Hypnotize" a couple of decades later. This 12" release of the No Exit track had given The Angels a third top 30 hit in November 1979, and as the '80s began, the band were recovering from a New Year's Eve concert on the Sydney Opera House steps that had turned riotous, with singer Doc Neeson and bass player Chris Bailey hit by flying bottles and requiring stitches. Bigger things for The Angels were just around the corner, with a new record deal signed in the next couple of months. Another song that had reached its highest position in November was this debut hit for British singer/songwriter Nick Lowe. "Cruel To Be Kind" seemed to have a thing for the number 12 spot, peaking at the same position in the UK, the US, Canada and New Zealand. Nick would return to the Australian top 50 in six years' time with "I Knew The Bride (When She Used To Rock 'n' Roll)". Plenty of songs have had a helping hand up the chart after being used in TV commercials, but here's a TV jingle that was subsequently turned into a song. Written to promote the Nine Network's World Series Cricket, "C'mon Aussie C'mon" had topped the chart for two weeks in February 1979. Refreshed in time for the 1979/80 season, a new version of the song, once again recorded by advertising agency Mojo, returned the sporting anthem to the top 10. The last time Lionel Richie and friends had reached the Australian top 50, they'd gone all the way to number 1 here with US chart-topping soul ballad "Three Times A Lady". Although this track from the Midnight Magic album also reached number 1 on the Billboard chart, its reception locally was considerably more muted, having peaked just inside the top 40 in mid-December. It'd been three years between hits for Cliff Richard, whose last top 50 appearance had been with number 3 single "Devil Woman" in 1976. As well as hitting that same peak with "We Don't Talk Anymore", the Peter Pan of Pop returned to the top of the UK chart for the first time in 11 years and would be a much more regular hitmaker in the years to follow. Also returning to the Australian chart after a lengthy gap was British rock band Status Quo, with this title track of their 12th studio album. "Whatever You Want", which years later would feature in a truly awful ad campaign for Coles supermarkets, would be the Quo's final top 50 appearance locally despite the fact that the band are still together today. From some well-established international acts returning the chart we turn now to an Australian band making its first top 50 appearance. Combining throwback rock sounds with new wave stylings, Melbourne's The Aliens were still climbing with their debut single, which was produced by Charles Fisher, who'd go on to produce some of the most successful local albums of all time by Moving Pictures, 1927 and Savage Garden. I was a huge Muppets fan at this time in my life, and I recall seeing The Muppet Movie and loving this song performed by Kermit the Frog in the film's opening minutes. On its way to a top 15 peak in the wake of the movie's mid-December Australian release, the Oscar-nominated song became the Jim Henson franchise's signature song - and I defy anyone to watch the clip now and not a) tear up and b) disappear down a YouTube wormhole of Muppets-related videos. Next up, it's new wave pioneers The Cars with the first of their three Australian top 10 hits, which had reached its peak in October. Although written by Ric Ocasek, lead vocals on "Let's Go" were handled by the band's other singer, Benjamin Orr. Although a couple of their biggest hits were still to come in the early '80s, Dr Hook will always represent the '70s to me, and that blend of country and soft rock that proliferated throughout the decade. The lead single from the band's ninth album, Sometimes You Win, "Better Love Next Time" also appeared on their 1980 compilation Greatest Hits, which was one of the only contemporary albums my parents bought during my childhood. Another artist who personifies the '70s is original rock chick and Happy Days guest star Suzi Quatro, who'd racked up three number 1 hits in 1973-74. Although she also had one more top 10 hit up her sleeve, her best days were behind her, and even this song written by hitmakers Mike Chapman and Nicky Chinn could only climb a few more places. While my parents liked the soothing tones of Dr Hook, my eldest sister thought The Rads ruled. "Comin' Home" was their debut single, and I have to admit I'm surprised to see it feature on this chart since I would've sworn it came out later. After this solid start, things went down (sorry!) with the pub band's next single, "Gimme Head", which missed the top 100 entirely. I have a vague recollection of seeing The Life And Times Of Grizzly Adams on TV... and then swiftly changing channels, but I don't really recall this limp theme song, which reached its highest point in November. And I'm sure in about five minutes' time I'll have forgotten how the dreary ballad goes... with any luck. Pop tune or advertising jingle - you be the judge. The theme song for the Farrah Fawcett movie of the same name was a solo project from the 10cc and Wax member, but one that is nowhere near as good as the best songs by those bands. He had four albums to his name already, but it wasn't until Rupert Holmes released this track from fifth album Partners In Crime - and agreed to give the song its subtitle - that his career took off. The song about a man who answers a personals ad from his "own lovely lady" topped the US chart and made the Australian top 3, but after its runaway success at the dawn of the decade, it soon became written off as cheesy. Proving all things are cyclical, "Escape" has enjoyed quite a resurgence this century thanks to its almost constant use in films and TV shows, recently in the first Guardians Of The Galaxy movie. To quote this spoken word festive release, "I just don't know where to begin." What even is this? And, more importantly, who was buying it? With a twangy version of "Silent Night" in the background, radio DJ Keith McGowan delivered this sob story of a tale about a boy who'd lost his parents on Christmas Day the year before. I don't want to sound hard-hearted, but this is the worst idea for a seasonal record ever. This song written by Elvis Costello (and later released as a B-side by him) brought Dave Edmunds back to the Australian top 10 for the first time in seven years, having previously visited there on two other occasions. A last hurrah for the Welsh singer, "Girls Talk" was his final hit locally. "Blame It On The Boogie" wasn't the oldest song on the first countdown of the '80s. This ballad by Italian singer Umberto Tozzi had been released in 1977 and eventually found favour down under. "Ti Amo" was one of two Umberto songs later covered - and turned into monster hits - by Laura Branigan. The other: "Gloria". Like The Radiators, Australian Crawl were a brand new band charting with their debut single at this point in time. A modest success, "Beautiful People" has since become one of the band's best known songs and kicked off a string of hits culminating with the chart-topping Semantics EP. Proof that even in 1980, music could be horrendous, this novelty single dated back to 1977, when The Smurfs were still just characters in a comic strip and not yet Saturday morning TV entertainment for kids (including me) around the world. Recorded by Dutch musician Pierre Kartner, "The Smurf Song" had reached number 2 in the UK in mid-1978 and slowly finagled its way into the Australian chart as the decade ended. In Part 2: the worst is behind us! There's nothing as bad as "The Smurf Song" or "A Little Boy's Christmas Prayer" in the first top 25 of the '80s. Instead, get set for classic after classic from the likes of KISS, ABBA, The Police and Cheap Trick, plus some long-forgotten obscurities. I have thought before that maybe you should do the pre-ARIA segment of the 80s... if you want to give yourself more work. I didn't realise 'Blame It On the Boogie' became a hit here 18 months after its overseas release. Odd! Didn't know the Herb Alpert track. It's funky. I wouldn't have known the Nick Lowe track if not for it being aired on rage a few years ago, along with a bunch of his other videos. Nice song. I knew the Mojo Singers song through the ad still running several years later (I'm thinking 1983-4). Awful. I too liked the Muppets, but sorry, 'Rainbow Connection' is awful. One 'Muppets' video worth checking out, if you have a similar sense of humour to me, is one of Miss Piggy apparently lip syncing Peaches' 'F*** the Pain Away'. It's edited together so well that it really does look like Miss Piggy is mouthing the lyrics. Not being much of a TV buff (aside from music videos), I've never encountered the Rupert Holmes song other than on a Countdown repeat on rage. I like it. It's interesting that the Laura Branigan version of 'Ti Amo' became a big hit just 5 years after the original.